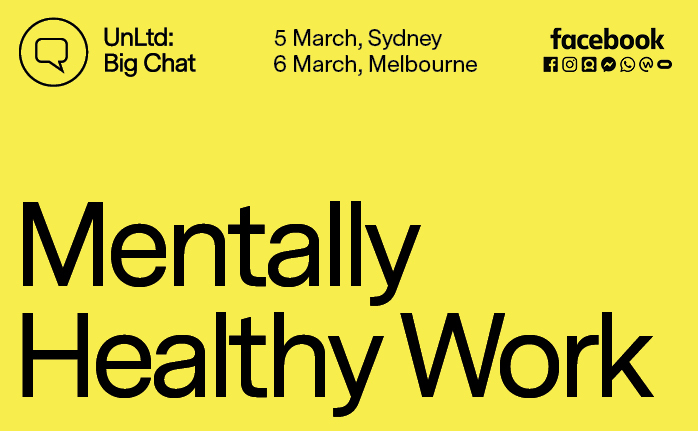 On 5 March in Sydney and 6 March in Melbourne we held our Big Chat: Mentally Healthy Work events that discussed how to create mentally healthy work places and how to look after your staffs’ and your own mental health. This event followed on from the results we released last year in the Mentally Healthy Survey, the first major study into the mental health of the creative, media and marketing industry. The event saw three speakers sharing their own personal experiences, insights and tips. Kindly hosted by Facebook, the guest speakers included Mitch Wallis from Heart on My Sleeve, Catherine Bowe from Facebook, Elizabeth Shaw from Relationships Australia NSW, Jodie Patten from Relationships Australia VIC and Josh Wiseman from batyr.